This writing box has space for quills, ink and a blotting agent made of sandarac resin. The intricate decoration on the outside, based on popular prints of the period, suggests it was a prized possession. Perhaps the intention is to contrast the civilised ability to write with the animal behaviour of the wildman crawling on all fours. 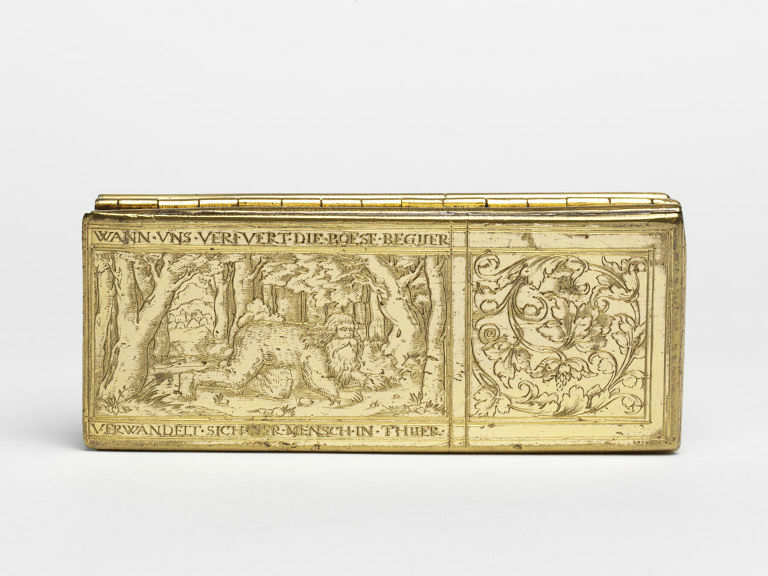 Gilt brass writing box engraved with two scenes symbolising human chaos and corruptibility: on the lid, a wodewose or wild man with the inscription in German: When evil lust leads us astray man becomes an animal; on the reverse with the traditional image of human chaos, a fool breaking up household implements, with the inscription in Dutch St. Nobody is my name. Before modern transport people largely travelled on foot or on horseback. Useful everyday items needed to be carried comfortably on the body. Some were miniature versions of larger objects, others folded ingeniously to become portable. Often they were intricate and delicate. These eleven items were personal possessions. Many were made before pockets were commonplace. Some were used in the workplace, some at home and some on the road. Many have cases as stylish as the objects they protect. 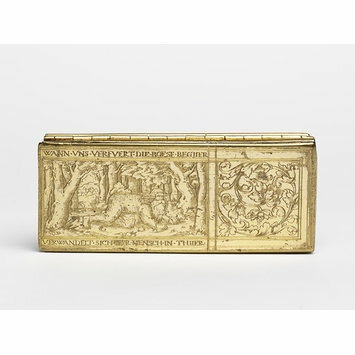 These cases came in a range of materials, from expensive ivory and sharkskin to cheaper leather and wood. Their decoration shows the same designs that adorn silver, ceramics and textiles.